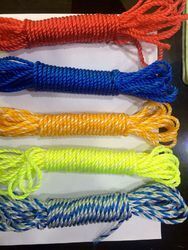 Offering you a complete choice of products which include pp ropes. These ropes being lighter by nature finds a lot of demand in international market and are highly recommended for various Purpose such as Safety float, Truck, Barrier, Ship docking, etc. and are available in various colors & Sizes. These are soft and uniform, with their superior knot holding capabilities are ideal for a wide range of application & are available in Loop and Reel form. Looking for PP Ropes ?